I LOVE spaghetti squash. I'd much rather have it than regular spaghetti! Feel free to use whatever veg you have on hand and if you get a little overzealous with the stuffing and toppings? Fret not! The leftovers can be saved for an epic omelette the next morning. Place inside a baking dish or atop rimmed, lined baking sheet [some liquid will escape] and roast face-down for 30-40 minutes, or until tender and easily pierced with a fork. The squash can be roasted and stored in the fridge for up to 3-4 days awaiting it's stuffage with your lovely ingredients. You can also make the whole shebang one weekend and pop it in the fridge until about 30 minutes before dinnertime. Wind up with a little bit leftover? It reheats marvelously the following day! Now let's get back to the recipe! While the squash roast, cook chicken via your favorite method or squirrel away leftovers from the previous night's dinner. I poached mine. Chop chicken into bite sized pieces and toss with pesto. In a small pot, heat a drizzle of olive oil to medium-high heat and sauté your bell pepper and carrot for a few minutes until tender. Next add the spinach and pesto chicken and stir to wilt the spinach. Next add your cheese to the hot mixture. Mix a little over half the cheese in with the chicken and veggies and save the rest for topping. 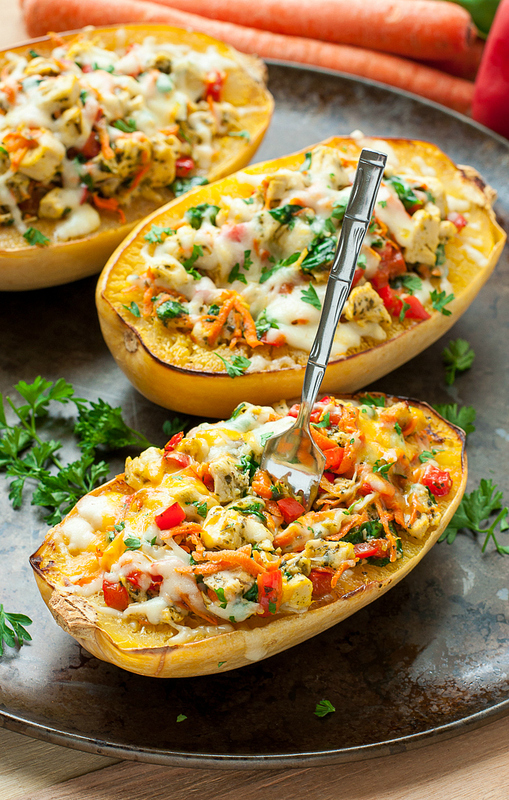 To stuff the squash you can simply pile on your pesto chicken and veggies or fluff the squash first with a fork before stirring in all you yummy mix-ins so there's yummy squash in every bite! Top with the rest of your grated cheese and cover the baking dish in foil, leaving a little room at the top [like a tent!] so the cheese doesn't stick. Bake at 350 degrees F for around 20-30 minutes or until hot and bubbly.